Regular readers of this blog know I am a Windows Mobile user and, dare I say, fan. I am on my third Windows Mobile phone now (Two Nokia’s and one Alcatel-Onetouch) Two of the phones I used on T-Mobile and one on Verizon. My experience with Verizon was, I thought, the pits. This company cares nothing about any of its users except for those using Apple products. Android and other devices are treated like second rate citizens. So, after getting fed up with Verizon’s treatment of the Windows Mobile devices, I decided to buy into John Legere’s statements about the un-carrier, T-Mobile. Now, I had used them while on Sprint. I got a Nokia Lumia 521 to see if I would even like Windows Phone (as it was called then) and, if I did, perhaps I would switch us over to them. Well, the Icon was released on Verizon and that was the phone I wanted anyway. So, once my Sprint contract was up, I went to Verizon. That was prior to realizing just how poorly they treat their customers and what they thought of anything other than Apple. I should have known when the salesperson laughed when I asked about the Windows stuff. 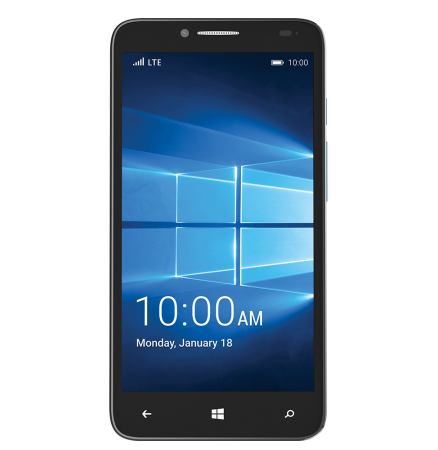 When my Icon got to the point where it was only staying charged for a few hours, I decided to jump to T-Mobile, they had just gotten the Alcatel Onetouch Fierce XL with Windows 10. Not a terrific phone, but it was more up to date and fairly cheap, $140 US. So, I switched. After a few days, I realize the coverage really isn’t that great. Then I got an email inviting me to use a couple of apps to make the experience better. Guess what? Those apps were for iOS and Android. Guess how many apps they have for Windows Mobile? TWO. The account app, which is just a wrapper for the mobile ‘My T-Mobile’ site and the TV app. Thanks, t-mobile. Then, because I selected the 3gb Simply Prepaid plan, I discover I am not eligible for the Binge On feature they so heavily promote. Now I feel like I’ve been mislead. Then, Mr. Legere want’s to ‘thank’ everyone for using T-Mobile. Great. I go to participate only to hit road block after road block. There’s no app for the Windows or Blackberry devices, so you are directed to a crappy web site. I go there, only to be told I am in-eligible because…get this…I am PREPAID. I have to use the APP for that. Buuuut….there’s no app for my device. Seriously? So, I take to Twitter. Bitterly complaining, even whining about it. At that point, I wasn’t so much interested in free stuff (though that is always a good thing, right?) but was more upset over the misleading ads, tweets and bs from T-Mobile about this and everything else. It was, as they say, the straw that broke the camel’s back. I got some nice responses from T-Mobile’s Twitter response team. They even gave me free Pizza from Domino’s, which my family thoroughly enjoyed. I was told the ‘problem’ was fixed, I’d be able to participate. “I care about you and want to make sure you can properly get thanked for being a T-Mobile customer. Currently prepaid can only play on the app versions. I know this is never fun hearing when you have a device that this does not work with. I care about you and we love having you as a customer. I have offset your account with a $40 credit as a one time courtesy to show you that we truly value you as a customer. Your current plan does not have Binge On, but it does have Data maximizer: If you activated a Simply Prepaid plan on or after January 24, 2016, then you already have our Data Maximizer, a network enhancement that optimizes all detectable video streaming to DVD-quality (typically 480p or better). This feature is automatically enabled, allowing your high-speed data to last up to 3 times longer. We do have Binge on available on our $65 North american prepaid plan that includes 6GB of web and I would be delighted to help change to that plan, if that is something that you would like. So, while they gave me a forty dollar credit-thanks for that-I am told, bluntly, that I’m not good enough because of my device and plan selections, even though they had said ‘all customers’ and I was told specifically, that it was fixed. I was also told that prepaid or not, I should be able to use the web site. Basically, they lied. Again, it isn’t about getting something for nothing. It’s being mislead and outright lied to…by the help desk staff, by the ads and by Mr. Legere himself. So, like Sprint and Verizon, if you don’t get their expensive plan and phone, then you don’t matter. As for the wrong platform, that’s just nonsense…Microsoft offers tools that takes iOS app source code and converts it UWP code. From what I understand, it is a rather straightforward process and does not take a lot of time. There are several apps out in the Windows Mobile store that were developed this way…the latest Candy Crush Saga games were done this way as well as some banking and other non-gaming apps. I did go back and look at the Binge On ad…buried in the very fine print, they do specify the plans it applies to…but the ads and Legere’s Tweets, imply otherwise. Same for this current promotion. Now I know that in any future promotion, I will be treated the same. Unless I buy an iPhone 6 or Samsung Galaxy S whatever and go on an expensive $65 a month plan. AT and T, can you do better? In effect, they consider me a non-customer as that site is for some drawing for non-customers. Nice. Funny thing happens when you buy a piece of technology that, at the time, seems to be cutting edge. Yet, in just a few short years, it will become obsolete, regardless if it is still useful or not. Such a wonder is the original Amazon Kindle. Introduced in 2007, the innovative Kindle eReader was an ugly and expensive device. It languished a bit until Oprah Winfrey devoted an entire show to the device. Jeff Bezos came on and explained the device, Ms. Winfrey had a family explain how much they loved it and, best of all, the device was made available at a substantial discount if you used the magic code from the Oprah show. Each studio audience member also got one for free. The device took off after that and so did the eReader category. Within a year or two, there dozens of devices available at a wide range of cost, from $99 to $500. 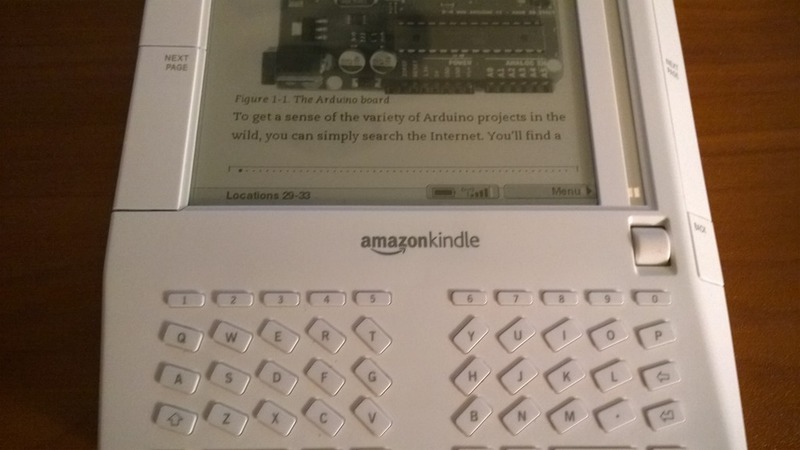 The original Kindle was all white, used e-ink display technology and had a cell radio and something called Whispersync, which allowed for over the cell-air purchase and downloading of content. It would also keep your device in synch with other Kindle devices, be it a computer or another Kindle. The cell radio was on the Sprint network and worked reasonably well. You could turn the radio off to conserve power. Speaking of power, the device sipped the juice very conservatively. One could go weeks on a charge, as long as the radio was off. The design of the device was unique. Wedge shaped, it feature this funky ‘elevator’ control that you would use to select lines or options. One would ‘click’ the wheel to make a selection. There were lots of buttons, including a full but split qwerty keyboard and very large next and previous page buttons. 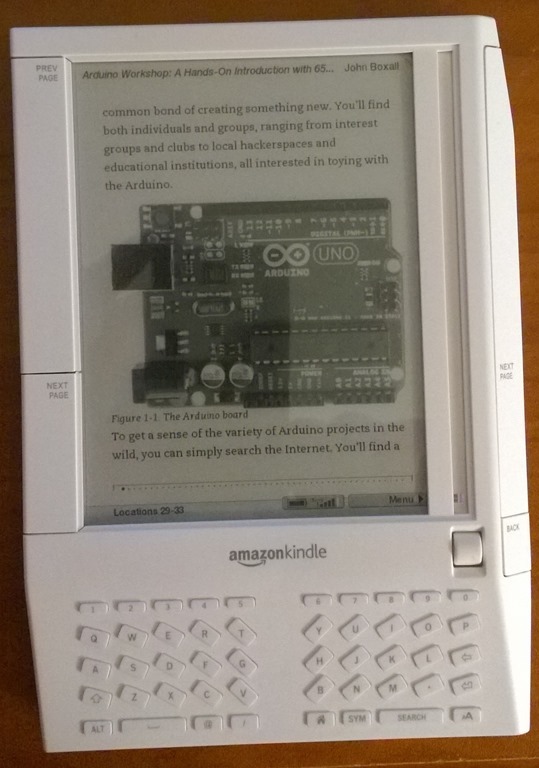 The on device software was fairly complete and featured a very crude web browser (something later Kindles would eschew) and a basic mp3 player that would play music while you read. The browser, believe it or not, came in very handy during several storms and hurricanes. In fact, at one point during a hurricane in 2012, it was the only way we could get news while we were home. All of the cell phones had run out of battery power, and there was no internet so the iPad was kind of useless. I broke out the Kindle, which was about half charged, and not only caught up on the news, but was able to check the power company web site to see if restoration was near. Amazon realized, by the time the Kindle 2 came out, that giving away life time service from Sprint was a costly thing to do and made the browser only work via Wi-Fi in later devices. However, I’ve had my original Kindle since its introduction and STILL have the Whispersync service, even though another company services Amazon along with the grandfathered Sprint devices. Overall, the original Kindle, while ugly, was a great device. It has since been made obsolete by newer and better devices from Amazon, Sony, Barnes and Noble, Samsung and others but this first device will always have a soft spot in my heart. My wife got me a Lumia 521 Windows 8 Phone for my birthday. It’s a very nice device for the money. It is bigger than the iPhone 4/4s and much speedier too. The Windows 8 interface is easy to use and looks nice too. The phone, a prepaid device on T-Mobile, is likely to replace my aging and very slow iPhone 4. We are currently on the Sprint network and have abysmal service. As it is our ONLY phone service, I am anxious to replace it. I was hoping that T-Mobile would be my answer. So far, however, I have not been able to find out. We got the phone just before Christmas, 2013. It is now late January and I’ve still not been able to use the phone as, you know, a PHONE. It has been terrific as a WiFi only device, a 4.3 inch tablet. Windows Phone 8 works terrific is this regard. So, what’s the problem? Well, initially, I could not activate the phone and its included SIM card. Now, this is my first exposure to SIM cards as Sprint does not use them. I try to activate the phone and prepay for the service. I still have months left on my Sprint contract, so I thought the prepay route would be a great way to test the waters with another carrier. Upon trying to activate, the web page tells me that there is a problem with the SIM card and that the phone’s IMEI is not valid. So, I call the number provided. Now, before I go on, let me say that I have nothing against anyone who cannot speak my language very well (hell, I have issues myself) but…if you are going to be in a CALL CENTER answering calls in ENGLISH, then you should damn well know how to speak it and do so that the caller doesn’t have to ask you to repeat yourself time and time again. When the phone call was answered, it was obvious that I was dealing with someone not in the United States. The person spoke so poorly that I was continuously having to ask him to repeat himself. It was embarrassing for both of us. I’m sure the gentleman was doing his best, but he did not belong in this particular job. After a very painful 20 minute or so call, he informs me that I would have to take the device to the store where I got it. Well, it was ordered online, from Best Buy during one of its sales. I finally got around to going to a Best Buy store to have the issue resolved. A very nice lady, Shannon, tried, desparately, to get my phone working. And, she got farther than I did. 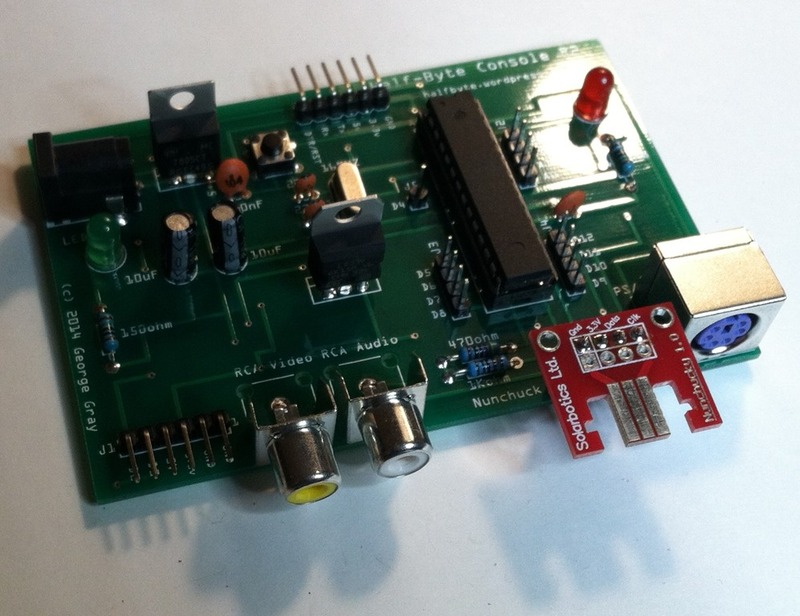 …the bloody card was too damn big. There are, apparently, many different sized SIM cards and Best Buy only carries the standard size in the stores. WHAT? So, Shannon calls the nearest T-Mobile store to see if they would swap out my defective SIM for a new one and activate it. They said sure, for $21. WHAT? Yep, they want to charge $21 to swap out a defective card that T-Mobile gave me in the first place! Mind you, the defective SIM was IN THE BOX, FROM T-MOBILE. I see why they are a distant fourth in the cell business. AT&T may have been smart to not buy them. Shannon then proceeded to check around the local Best Buy stores to see if they had a micro SIM that I could get. They didn’t. She found out that Best Buy does carry them, but only online. She ordered me one. Should be in in about a week. I’m OK with that. I don’t blame Best Buy for this problem. The blame is squarely on T-Mobile. They packaged the phone and SIM card. They should have taken care of it. When I called them the first time. They should have just sent me a replacement card or, at the very least, had me go to one of their stores and pick one up, as an exchange. The didn’t do that. Now, to be fair, I did take to Facebook and complained on the T-Mobile page. I was instructed to go to the web site and make the complaint there. I did. I got a reply back, a day later, saying that they were ‘very sorry’ and that IF I had to pay for another card, they ‘would make it right’, implying-but not saying directly-that I would be refunded the amount. Sorry, folks, that’s not good enough. I should NOT have to pay at all. This was their mistake, THEY should have made it right. Best Buy went above what I expected of them. I only went there because I was told to take the phone back to where I got it. Looking back, I think the guy meant to say to take it to a T-Mobile store, but that is not what he said. I’m still willing to switch my family over to T-Mobile if the service (the radio service, that is) is more reliable and better than Sprint. I suspect it will be. Even though the phone was not usable as a phone, it still connected to T-Mobile and showed me both the speed and signal strength. I get solid 4G service where I live, which is important. Most places we go seem to get the solid, 4G service, so I am hopeful. So far, though, I am far from impressed with T-Mobile. They are worse than Sprint in the Customer Service arena so far, and that is saying something. They could take a lesson or two in excellent customer service from Chik-Fil-A, a company that prides itself on excellent service. I’ve been a Sprint customer for nearly 16 years now and have rarely ever gotten what I would call good service, customer service or cell service. I’ve stayed with them mainly for convenience. However, since moving three years ago, the cell service in this area is just abysmal. So, I will know in a week or so if I like the actual T-Mobile service. I will follow up this post with how it goes with the new SIM card. When last we met, I had ordered two iPhone 4’s for my wife and son. The phones arrived a day after ordering them, thank you Sprint. Turns out the online ordering and delivery was a decent experience. Activating them, however, not so much. Following the directions on the web site, I carefully key in the IMEI numbers. One worked, the other did not. The one that ‘worked’ did not fully activate. I had to call Sprint for both phones. Let me tell you, I DO NOT LIKE those damned automated answering systems these companies insist on using. Fortunately, I got right through to a very nice young lady who helped me out fairly quickly. She not only got the phones activated, she also checked to see if the Windows 8 phones were on the horizon for Sprint. She found nothing, which is about what I expected. At any rate, she was very polite, very friendly and, more importantly, very helpful. Sprint seems to be stepping up their game in the customer service arena. Once the phones were activated and working, I wanted to upgrade iOS. Other than just taking a lot of time, that went pretty easily. I upgraded my son’s phone first and then my wife’s. While upgrading hers, I put my son’s music and iPod Touch apps on his iPhone. That was pretty easy and the only thing he lost was a song I bought for him a few months ago. Not sure why the track would not transfer. We got the apps and music transferred that he wanted and he is happy with his new phone. So far, I am impressed with the iPhone. While Apple’s claim of ‘it just works’ is far from the truth, the simple fact is that iOS is superior to Android, the quality of the iPhone 4 is way better than that Samsung Intercept or HTC EVO Shift of mine (the Intercept was my son’s old phone.) And, from what I have seen and heard today, I may be getting an iPhone 4 for myself. I want the Windows Phone 8, but it looks like Sprint is holding out on the phones. Not happy about that, but I am not switching carriers for a phone. While getting the phone proved to be an adventure (see my previous post) and activating was not perfect, this has turned out to be an not too bad experience and the phone is fairly impressive. And, best of all, both my son and my wife love the phone and, really, that is all that matters. About a year and a half ago, I got my son a Samsung Android phone (the Intercept.) The phone was inexpensive, either $49 or $99, but it turned out to be a real piece of crap. Android notwithstanding, the phone was just junk. It randomly loses connectivity, boots very slowly and runs the battery down very quickly. He really wanted-and still wants-an iPhone. Well, he is now eligible for an upgrade, and since Sprint carries the iPhone 4 with a zero to me upfront cost, I thought I would bite the bullet and retract my no Apple stance and get him the phone he wanted. Soooo…. I go to Best Buy to get the phone. What a mistake. First, the store looks like it is on the verge of closing. The front section, where the checkouts used to be, was sparse. Two counters and some displays. It looks like they are having supply issues and have spread out the stock. It just didn’t feel fully stocked. Not like a normal Best Buy. The mobile area, however, was very busy. We waited, approximately, 10 minutes before someone asked if we needed help. I said yes and they replied it would be a few more minutes. That was fine, I know phones take too much time. Then, a manager type asked what I was looking for and I explained I wanted the Sprint iPhone 4. He said ‘oh, we are out of stock. The closest store that still has them is in Colonial Heights.’ Well, that store would have been a 45 minute drive by the interstate, which we did not want to do. So, we left. I thought, surely the Sprint store would have them. The closest Sprint store was just a few minutes away, so we went there. Upon telling the sales guy what I wanted, he explained that ‘Apple has pulled them all back and you must order them online.’ Well, it seems that is not quite accurate. A check online (I missed this nugget when it happened) reveals that Sprint has discontinued them from the retail stores, but they are still available online. While having dinner, I decide to try the local Apple store. So, I pull out my HTC Shift and lookup the number. Finding the number to the local retail store on Apple’s site was an exercise in frustration. They have the retail stuff buried. But, I did find it and called the number. After be quizzed by a male-sounding Siri like automated answering service, I was finally transferred ‘to the right specialist. Only, I was not. A pleasant sounding female voice told me there were five calls ahead of me. After waiting nearly ten minutes, and still having five calls ahead of me, I just hung up. I tried calling the Target just across from where we were eating. Not only do they carry phones for Sprint, they carry the iPhone 4 and 4s. Great! “Oh, you said Sprint!? Sorry, that one is out of stock and I don’t think we are getting any more.” Well, damn. Another call to the Apple store ended in frustration as well. With seven calls ahead of me for another ten minutes, I just hung up. Now, I was resigned to the fact that I would have to order the bloody thing online. Sprint is making a big deal about carrying iPhone but only the ones that cost any real money. I know they have sunk nearly five billion dollars into this phone and they do need to recoup some of that cost upfront, but, seriously, I might have been open to upgrading to the 4S, but not now. I am determined to stick with the 4 just because of the hassle. And, Apple, if you want me to visit your stores, make them more available on your website and on the damned phone. Oh, and why the hell can’t I find out, online, if a product is available in my local Apple store? Seriously, Wal-Mart does it. Target does it. Certainly, your developers can cobble something together. Right? Oh, yeah…maps…maybe they are busily fixing the maps. Yeah, that must be it.